9x12, xviii + 117 pp. During the period 1820–30, the noted pianist, composer, and teacher Johann Nepomuk Hummel (1778–1837) was commissioned by the English entrepeneur J. R. Schultz to transcribe orchestral works by Haydn, Mozart, Beethoven, and others. Hummel scored all of these transcriptions for piano, flute, violin, and cello. 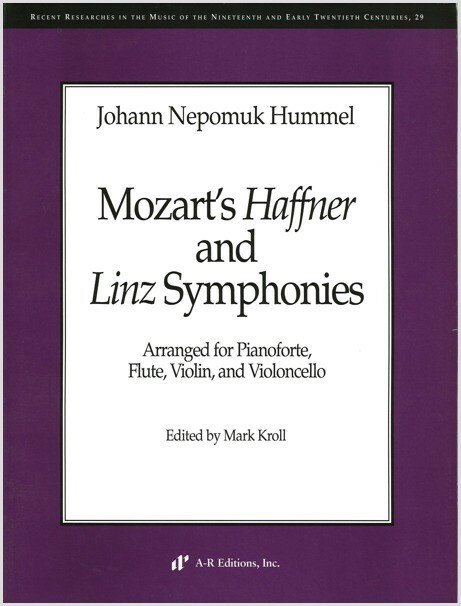 The Haffner and Linz arrangements appeared as two of six Mozart symphony arrangements published in London in 1824. The practice of arranging large-scale works for small ensembles was very popular during the early nineteenth century. Playing transcriptions was an ideal way to learn the newest compositions and also was a favorite mode of home entertainment (and, at times, romantic courtship). The majority of the public experienced orchestral music in their homes through the kind of chamber settings Hummel created. While many composers were asked to make such arrangements, their efforts met with limited success. Hummel, however, was ideally suited to the task. As a student and close friend of Mozart, and a colleague of both Haydn and Beethoven, Hummel also conducted many symphonies and operas in his capacity as kappelmeister in Weimar. Hummel's contributions to the transcription literature are masterful examples, full of virtuosity and inspiration; they also contain valuable information about the performance practices of the period. Most of all, these transcriptions open a window to the past and allow us to observe an excellent composer viewing his greater contemporaries.